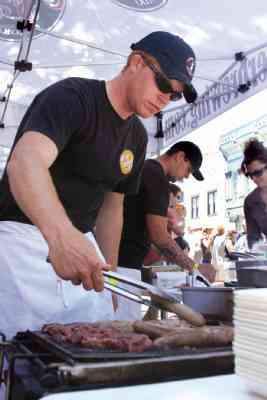 Justin Myers grills to perfection for Carvers Brewing Co. downtown on Sunday for Taste of Durango. Something was missing at Taste of Durango this year. No rain. No hail. No gale-force wind or scorching heat. The often-fickle May weather was sunny and warm with a cool breeze for the entire event. allowed people to sample a variety of food from street booths hosted by local restaurants. Proceeds this year will benefit the Manna Soup Kitchen, DHS ProStart Culinary Program and other local nonprofits. The event includes a judged competition, but results of the winning restaurants were not available at press time. Connie and David Trautmann, 12-year Durango residents, said they have never missed the Taste of Durango. because I know it's for a good cause," said Connie Trautmann. Greg Rathbun, executive chef at Guido's Favorite Foods, said he thought there were fewer people attending this year, although the crowd was still elbow-to-elbow. "It seemed to me that it wasn't nearly as busy for us as last year," said Rathbun. "But we still sold out of food by 3 p.m."
He said serving food on the street can be a challenge, especially when grilling to order. But he said much of the lasagna, bruschetta and shrimp salad Guido's offered was prepared in advance for quick service. The standout dish of the day, according to several tasters in the crowd, was Crab Tater Tots with Remoulade Sauce from Cosmpolitan. For a few years now, this restaurant has managed to merge gourmet and blue-collar tastes into an imaginative dish. The Lobster Corn Dogs on their current menu is another example of playful ingenuity. The Crab Tater Tots were two doughnut-hole sized balls fried to perfection and served steaming hot - not an easy feat on the street. The crispy, bread-crumb exterior contained a soft crab filling. The light, lemony remoulade was a nice complement to the fried food. favorites every year, such as ribs, brats and microbrews. Other restaurants go above and beyond to impress tasters with unusual flavor combinations. White Gazpacho from Kennebec Café was this type of offering. It was a sour cream-based cold soup with sweet, sliced grapes and crunchy almonds. The flavor was surprising, given that gazpacho normally is a tomato-based menu item. The portion sizes also can be surprising. Some restaurants offer just a few, delicate bites with artful garnishes, while others filled a large plate with an entrée-sized meal for six tokens, or $3. Himalayan Kitchen piled a mountain of food on a plate, including Saag with Garlic Naan, Chicken Tikka Masala and Basmati Rice. Their saag, a spinach purée cooked with celery, mushrooms, cilantro and cream, was tasty but not especially flavorful. The garlicky chicken dish had a wonderful spicy and creamy sauce, and the chicken chunks were very tender. The naan was flaky and chewy like a thick tortilla, and delicious with a sprinkling of herbs. Rebekah Hartzog, of Durango, sat on the curb and dished on the chicken dish. "I've tried Indian food many times before, and this is good. Really good. It's not too spicy," she said. Cyprus Café's Moussaka Ravioli fell into the delicate and garnished category. It was spiced ground lamb, eggplant and béchamel sauce tucked between paper-thin pasta squares. A small square of Chocolate Frangelico Cheesecake from Kennebec Café was the rich, sweet conclusion to a $13 patchwork meal. Our local chefs' skills shone as brightly as the spring sunshine this year. 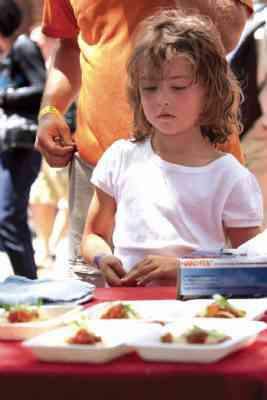 The event's yummy smorgasbord is a good reminder to feel gratitude and help support Durango's culinary abundance - even through the tough times. "I always feel good about being here, because I know it's for a good cause."